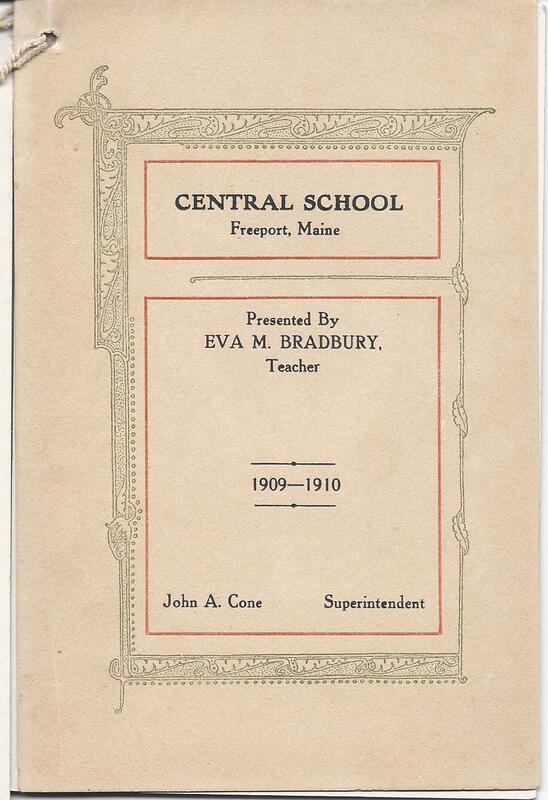 Lovely memento of the 1909/1910 school year at Central School in Freeport, Maine, featuring a photograph of teacher Eva M. Bradbury. The memento is comprised of cardstock covers and two interior leaves, approx. 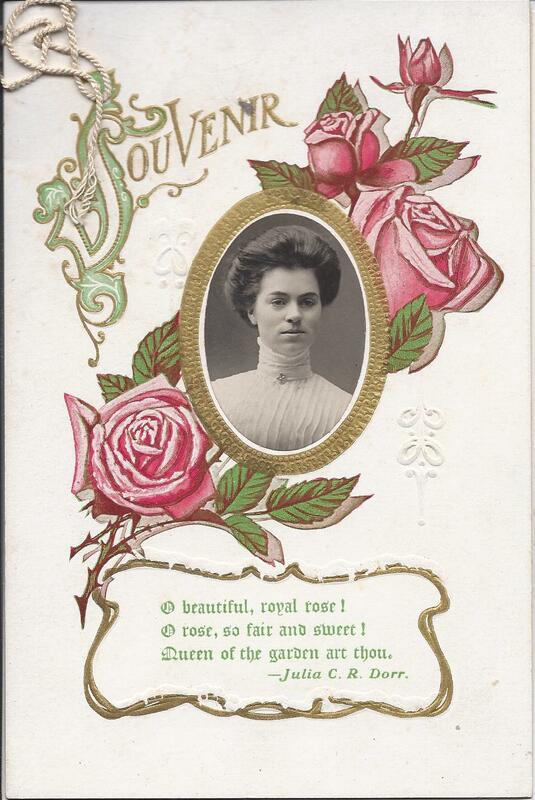 6-3/4" x 4-1/2", with text on the front cover and one side each of the interior leaves. The photograph appears to have been pasted on each front cover individually. Don't worry - the symbol at bottom is not what you might at first think. It's a symbol used and tweaked throughout antiquity with a variety of meanings. 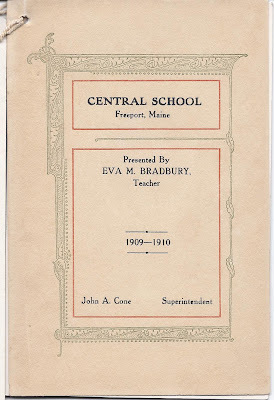 Teacher Eva M. Woodbury was born 27 June 1890 at Peaks Island, in Portland, Maine, the daughter of Lynus Edwin Bradbury and Alice M. Springer of Maine. 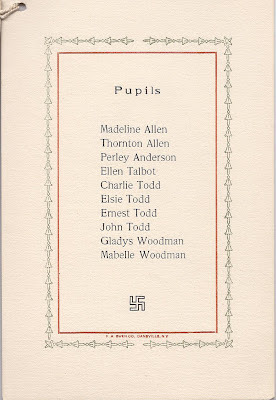 Her paternal grandparents were E. F. and Susan H. (Chandler) Bradbury. Her maternal grandparents were Henry and Nancy M. (Cating) Springer. Eva M. Bradbury married Elwood Stuart Fraser on 29 November 1917. He was born 31 July 1892 at Peaks Island, son of Port Mouton, Nova Scotia natives William James Fraser and wife Andevine (Stuart) Fraser. The 1920 Census found the couple at Taunton, Massachusetts where Elwood was a teacher in the area. The Census image is very faint, but I believe the entry for occupation for Eva is "none". By the time of the 1930 Census, they had moved to Rochester, New Hampshire, where Elwood Stuart Fraser was an area high school principal. Eva was at home with their five year old son. It appears that Elwood and Eva Fraser moved back to Maine, at least in retirement, as both of them died there, Eva in 1971 and Elwood in 1979. Superintendent John A. Cone was born 19 February 1859 at Bowdoinham, Maine, son of Charles and Margaret Cone. If you have any corrections, additions or insights regarding the information on the Bradbury, Fraser or Cone families, please leave a comment or contact me directly. 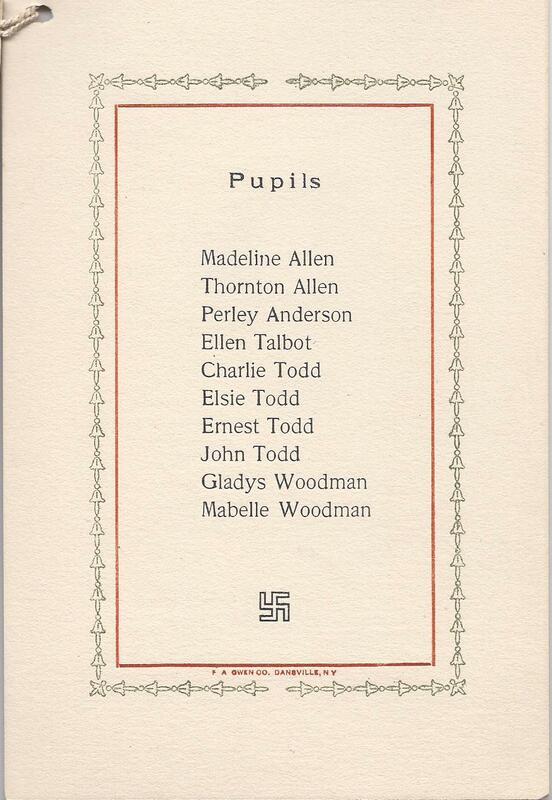 I believe Madeline Allen, born about 1901, and Thornton Allen, born about 1897, were the children of Amos and Maude Allen. Perley Anderson was born about 1898, son of George and Cora Anderson. Ellen Talbot was born about 1898, daughter of Herbert and Elsie Talbot. Charles Todd was born about 1895, son of Charles Todd. Elsie Todd, born about 1902; Ernest Todd, born about 1904; and John Todd, born about 1905, were the children of Frank and Mary Todd. Gladys Woodman, born 15 December 1900, was the daughter of Charles R. and Emma L. (Coffin) Woodman. Her birth name was Gladys Belle Woodman. Mabelle Woodman, or Mabel E. Woodman, was born about 1900, also the daughter of Charles R. and Emma L. Coffin, unless I've got information on Gladys Woodman and Mabelle Woodman mixed up. Thank you so much for taking the time to comment and add these insights. I know what you're saying about medical advances - my mother's only sibling was a blue baby born in 1929; she died at about six months. She was born about 15 years too soon.